Years ago, the leader of a tribe of cats by the name of Crooked was walking through the woods with a disgusted look on his face. He absolutely hated the other tribes, Fortum and Celer. He wanted to steal their territory to increase the size of his tribe, Sol. While he was walking, Crooked stumbled across a strange line of bracken and brambles. Curious, Crooked stepped over the line and into a peculiar area of land where no life grew and no light touched the ground. Crooked noticed that the barrier of brambles and bracken marked the territory of the lifeless land. While he was looking around the strange place, Crooked heard a cracked whisper come from behind him. He turned, expecting an ancient cat to be standing behind him, but instead there was a dark, shadowy figure of a cat hovering above him like a ghost. Only two yellow eyes shone on the shadow-cat’s face. “Who are you? !” Crooked hissed in alarm. The shadow-cat did not say a word, but a gleam of evil sparked in the figure’s eyes. At once, the shadow-cat lunged at Crooked. He tried to duck, but the shadow entered his body and locked itself in the tom’s heart, turning it icy cold. Crooked ran out of the evil land, trying to escape the darkness in his heart, but it did not leave. His mind suddenly filled with thoughts of anger and revenge, and Crooked’s fur darkened and spiked. He turned into a monster of a cat. Crooked, no longer his true self, stormed back into his tribe's camp. Many cats growled at him and approached him, thinking that Crooked was an intruder. When he stepped up on a large rock in the middle of camp and called a meeting, the tribe cats realized that the “monster” was their leader, and were shocked to see him in such a condition. Crooked told his tribe that they were to attack Fortum and Celer in an attempt to steal their territory and make all of the Great Forest their rightful home. After much discussion, the tribe cats of Sol finally agreed to ambush the other tribes. The next night, Sol attacked Fortum and Celer and a large battle broke out. For an entire moon the tribes fought, and many lives were lost. The war did not end until cats from each tribe decided to try and kill Crooked, and were successful. After the battle was over, the leader of Fortum, Moon, the leader of Celer, Cloud, and the deputy of Sol, Sun, met and revealed that they had all found a shadowed land where no life lived. The three decided to name the land the Shadow Moor, and that every cat was forbidden to step over the line of the moor. If a cat spotted a barrier of bramble and bracken, they were to turn away from it and run. Many moons passed, and one day a disastrous thunderstorm broke out, flooding the camps and destroying part of the line of bracken and bramble. The darkness and evil of the Shadow Moor rushed into the tribes’ camps, turning many cats’ hearts to ice. A few brave cats decided to try and repair the barrier of the Shadow Moor, locking the shadows back into their proper home. Unfortunately, the cats were unable to completely repair the border, and now, years after the great storm, the darkness of the Shadow Moor is leaking outside of its boundaries. More and more cats are becoming at risk of being pulled into the Shadow Moor’s grasp, and only the cats with light and warmth left in their hearts can save the tribes and banish the evil forever, or be gripped by the darkness themselves. Leader - The leader is the cat that is in charge of their tribe and are the ones that call tribe meetings. They have nine lives and are expected to be completely loyal and a good role model for their tribe. They have their own den. Deputy - The deputy of a tribe is the leader's helper, and the next cat to become leader if the current leader loses their last life. They are in charge of putting together patrols, and are also expected to be loyal and a good role model. Healer - The healer is the cat in charge of healing the sick and wounded of their clan. They have stunning expertise when it comes to herbs and how to treat them. They are allowed to have a mate, but it is considered a dishonor to their tribe. They have a special den. TribeCat - A TribeCat is a regular member of a tribe. They go on patrols, hunt for the clan, and mentor TribeCats in training. They are expected to be loyal to their clan. They may have a mate and kits if they choose. All TribeCats share their own den. Kit-Mothers (Queens) - Kit-Mothers are female TribeCats that are nursing or expecting Kittens. They stay in the nursery with their kits until they become Trainees. Kittens (Kits) - Kittens are the youngest of a tribe. They aren't quite ready to be Trainees, and they stay in a nursery with their Kit-Mothers. They are very playful but defenseless. Ancients (Elders) - The Ancients are retired TribeCats, Healers, Leaders, or Deputies. They are very old and wise. Although, if a cat is injured to the extent of not being able to hunt or fight, they will become an Ancient or the Healer's trainee. Aggressive WildCats (Rogues) - Aggressive WildCats are perfectly described by their name. They do not usually like tribe cats and steal prey from them. They are very aggressive at times and do not live in tribes, but can live in groups. Passive WildCats (Loners) - Passive WildCats aren't usually aggressive and live in one area. They don't mind the tribes and usually leave them alone, but they may talk to passing patrols every now and then. Domestic Cats - Domestic Cats are cats that belong to and live with humans. Most tribe cats dislike the soft life of these cats and choose to ignore their ways. And that's that. XD. Post away little kitties. Post away. Tribe/Clan: Shadow though later Fortum. Personality: Kori is an easy going kitten. She's friendly and kind to her friends and family, through to her enemies, she's hardly like that. Due to her past, that's how she was raised. Kill or be killed. She gets frightened easily, through she tries not to be and be as tough as she can. She has a deep fear of Nightmare, as he was her former master, and was the one that abused and hurt her mostly. Due to that, she's a bit frightened of new people, thinking they might be the same as Nightmare was, or working for him to take her back. History: Kori has a rather dark one. She was born in a village full of other cats, and was born to a female named Snowflake. Shortly after, she was kidnapped and taken to Nightmare's castle. There, she was beaten, abused, and tortured by the dark lord. Her only friend through all this was another cat named Shade. He helped her out when he thought she needed him to, and although she didn't want to admit it, she was glad for it. Being with Nightmare, it turned her cold, shutting out everyone that wasn't her master or Shade. She left and went back with Shade to Nightmare, for she knew that she had to, or else bad things would happen to the child. The two cats planned an escape, their friend, Magic, joined them in escaping, helping them out. The three escaped, though their wizard friend was killed in the making. After escaping, the young kit joined Fortum, the leader there allowing her to start over, a new life free. Other: She's Nightmare's apprentice/personal servant. She has scars hidden that Nightmare gave her. The most noticeable one would be the X shaped one on her right paw, hidden under her dark green glove. They sometimes start to bleed, putting her in a lot of pain. It's one of the ways that Nightmare can normally try and control her once more. Personality: Cinder is a kind little kit. She enjoys helping others, even though she can't all that much since she's still a kitten. Like most kits, she has a playfully nature, and loves to play with the other cats in the Clan. She dreams of become a soldier someday, and maybe even leader, though she doubts that will happen. History: Cinder grew up near where the Tall-walkers have their nests. She began to explore when she got old enough. She ended up getting lost because of that however. She lived in the forest near where the Clans were. Personality: He is timid and shy little cat, but he tries to be friends with everyone. However, since he is scared rather easy, his enemies sometimes use this to get what they want from him, so he tries to be careful of who he talks with and who his friends and family do as well. He also gets the timidness and easily startled or frightened nature from being bullying a lot by older cats, and his second oldest brother, Bolt. For this, he finds it hard to make friends with others, open up and talk with them. However, when he feels like he can trust you enough, he'll be your friend for the rest of both of your lives! Unless you do something bad to him... He also has a fear of being left alone and scared of the dark. History: Thunder grew up in the same group of cats as Kori had. He was born not long after she was taken away by one of Nightmare's cats. He was taken by a cat named Lightning, a golden tabby she-cat with green eyes. He became her servant until he escaped. 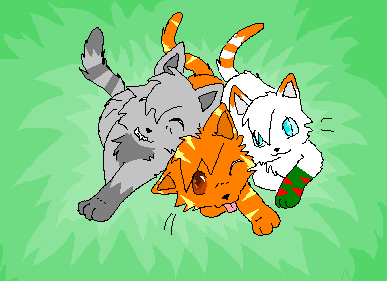 Once he had, he ran into Cinder and Kori, and the three became friends. Other: He has the spirit of a black-and-white cat named Dark living inside his mind, who talks to him and helps him out with things when the ghost cat can. Dark can also appear beside Thunder in a ghost-like from (meaning if you see him, we'll be see through), and he'll be able to talk anyone else around him. However, the cat can choice who can hear and see him and who can't when he does this. Personality: Ivy is a kind little cat. She enjoys helping other cats, even if they're from a different tribe/Clan. Aside from the Shadow Cats. She always tries to look on the bright sides of things, and encourage others when they're down. History: Ivy grew up in Celer. She dreamed of becoming the best TribeCat that she could be. She grew up on stories of the Shadow-Cats, and wished to help defeat the evil cats and save her home.